Nate Hughes of Webster City captured the feature race win in the Olsen Family USRA Modifieds on opening night at the Hamilton County Speedway driven by Spangler Automotive on Saturday, May 5. Mother Nature did her best to delay the season-opening event at the Hamilton County Speedway driven by Spangler Automotive by another week, but fans, officials and competitors ignored her threats and came together for the debut of the Summit USRA Weekly Racing Series at the historic facility in Webster City, Iowa, on Saturday. For four drivers in four classes, the effort paid off with a $1,000 winner's share of the prize money while another feature race winner went home with a $500 paycheck as participants in the Big Fish Challenge where drivers could buy in for a big bonus if they could find their way to victory lane. In the Olsen Family USRA Modifieds, the main event was a back-and-forth affair that saw front row starter J.D. Auringer bring out a caution on lap one, go to the work area and then pass everybody in the field only to break again and end his night. Josh Ruby led a large portion of the race only to hit the wall in turn one at the halfway point. Mark Elliott and Auringer had a heck of a battle for the lead, and Elliott finally had the lead to himself only to see Webster City's Nate Hughes drive around him on the top with five to go and go on to capture the win and $1,000 top prize. Elliott finished second ahead of Christopher Elliott while Garett Wilson claimed the fourth spot and polesitter Aaron Benson rounded out the top five. Churdan's Jason Minnehan and last year's Iron Man Challenge champion Derek Green had a great race late in the Seneca Foundry USRA Stock Cars. Minnehan got the $1,000 win by holding off Green and another Minnesota racer, Dan Mackenthun. Veteran Steve Jackson brought home a fourth-place finish and Luke Sathoff raced from 11th on the starting grid to fifth at the checkered flag. Another recipient of the $1,000 Big Fish Challenge bonus bucks, Jake Sachau of Denison started in the fourth row, snatched the lead on lap two and didn't look back for the win in the Stein Heating & Cooling USRA B-Mods. Carter Shumski finished second, Jared Timmerman claimed the third spot, Doug McCollough wound up fourth at the finish line and Ty Griffith rounded out the top five. Chanse Hollatz of Clear Lake topped the 20-car Diamond in the Rough USRA Hobby Stock main event by a close margin over Eric Stanton. Stanton had troubles in his heat race which forced him to start 17th in the contest but came up one position short of collecting the $1,000 winner's check. Myles Michehl held off Derek Willert for third, and Austin Jahnz finished fifth after taking the green flag from the tenth starting spot. The USRA Tuners also had the opportunity for a Big Fish Challenge with a $15 buy-in for a shot at a $500 payday. Nate Coopman took the challenge and the win to earn himself some gas money back up Interstate 35 to his home in Mankato, Minn. Defending Mason City Motor Speedway track champion Ryan Bryant settled for the runner-up position with Bubba Brown, Matt Baker and Matt Oberhelman completing the top five. The final checkered flag dropped at 10:21 despite a full program, light rain on two occasions and kids' bike races during the 2018 grand opening event. The historic Hamilton County Speedway driven by Spangler Automotive will roar back to life next Saturday, May 12, for the 2018 season debut for the Malvern Bank SLMR Late Models plus “Full-Fendered Fury” featuring extra money up for grabs in the Seneca Foundry USRA Stock Cars and Diamond in the Rough USRA Hobby Stocks. Olsen Family USRA Modifieds, Stein Heating & Cooling USRA B-Mods and USRA Tuners will complete the six-division card. 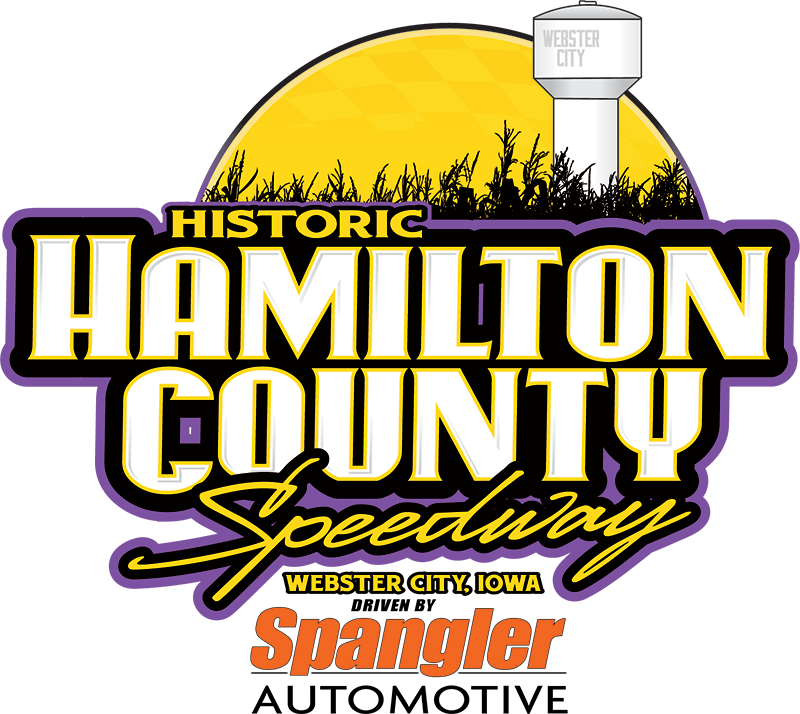 The historic Hamilton County Speedway driven by Spangler Automotive is the oldest speedway in the state of Iowa, opening in July 1910. In 1938, work began on the current location at the Hamilton County Fairgrounds. The semi-banked half-mile dirt track was completed in the spring of 1939, and the first races were held on the track in September of that year. The race track is located off of US 20 at exit 140, then 1.2 miles north, then 0.5 mile east on Bank St., then 0.4 mile south on Bluff St. in Webster City, Iowa (1200 Bluff St, Webster City, IA 50595). 1. (1) 30 Josh Ruby, Dakota, Iowa. 2. (4) 41 Nate Hughes, Webster City, Iowa. 3. (2) 75 Christopher Elliott, Webster City, Iowa. 5. (7) 49j Jason Murray, Hartford, Iowa. 6. (5) 8x Scott Olson, Blairsburg, Iowa. 7. (6) 2 Jarid Ratzke, Webster City, Iowa. 1. (2) 14e Chase Ellingson, Iowa Falls, Iowa. 2. (6) 00j J.D. Auringer, Evansdale, Iowa. 3. (1) 12 Mark Elliott, Webster City, Iowa. 4. (5) 24 Aaron Benson, Clear Lake, Iowa. 5. (4) 3w Garett Wilson, Carlisle, Iowa. 6. (3) 2e Kevin Hollingsworth, Des Moines, Iowa. 7. (7) 78 Jonathan Perin. 1. (8) 41 Nate Hughes, Webster City, Iowa, $1000. 2. (4) 12 Mark Elliott, Webster City, Iowa, $400. 3. (9) 75 Christopher Elliott, Webster City, Iowa, $350. 4. (5) 3w Garett Wilson, Carlisle, Iowa, $300. 5. (1) 24 Aaron Benson, Clear Lake, Iowa, $250. 6. (12) 2e Kevin Hollingsworth, Des Moines, Iowa, $200. 7. (3) 30 Josh Ruby, Dakota, Iowa, $175. 8. (2) 00j J.D. Auringer, Evansdale, Iowa, $150. 9. (14) 78 Jonathan Perin, $140. 10. (7) 5d Devon Havlik, Iowa Falls, Iowa, $130. 11. (11) 8x Scott Olson, Blairsburg, Iowa, $120. 12. (10) 49j Jason Murray, Hartford, Iowa, $110. 13. (6) 14e Chase Ellingson, Iowa Falls, Iowa, $105. 14. (13) 2 Jarid Ratzke, Webster City, Iowa, $75. 1. (1) 67 Kyle Falck, Decorah, Iowa. 2. (5) 2j Steve Jackson, Polk City, Iowa. 3. (6) 92 Dan Mackenthun, Hamburg, Minn.
4. (7) 2n Donavan Nunikohoven, Sully, Iowa. 5. (2) 20t Malcom Teachout, Livermore, Iowa. 6. (3) 5 Luke Sathoff, Jackson, Minn.
7. (8) 87 Dylan Suhr, Waterloo, Iowa. 8. (4) 51 Jared Dirks, Britt, Iowa. 1. (2) 7 Jason Minnehan, Churdan, Iowa. 2. (1) 32 Derek Green, Granada, Minn.
3. (5) 11k Darrin Korthals, Rock Rapids, Iowa. 4. (6) 21 Andrew Borchardt, Plymouth, Iowa. 5. (3) 4ord Bob Sutherland, Blairsburg, Iowa. 6. (7) 47 Parker Slagle, Eagle Grove, Iowa. 7. (4) 66L Brent Lyman, Iowa Falls, Iowa. 1. (2) 7 Jason Minnehan, Churdan, Iowa, $1000. 2. (4) 32 Derek Green, Granada, Minn., $300. 3. (5) 92 Dan Mackenthun, Hamburg, Minn., $250. 4. (3) 2j Steve Jackson, Polk City, Iowa, $200. 5. (11) 5 Luke Sathoff, Jackson, Minn., $175. 6. (8) 21 Andrew Borchardt, Plymouth, Iowa, $150. 7. (12) 47 Parker Slagle, Eagle Grove, Iowa, $130. 8. (9) 20t Malcom Teachout, Livermore, Iowa, $120. 9. (10) 4ord Bob Sutherland, Blairsburg, Iowa, $110. 10. (14) 66L Brent Lyman, Iowa Falls, Iowa, $100. 11. (7) 2n Donavan Nunikohoven, Sully, Iowa, $95. 12. (6) 11k Darrin Korthals, Rock Rapids, Iowa, $90. 13. (13) 87 Dylan Suhr, Waterloo, Iowa, $85. 14. (1) 67 Kyle Falck, Decorah, Iowa, $80. 15. (15) 51 Jared Dirks, Britt, Iowa, $75. 1. (2) 138 Jon Peed, Webster City, Iowa. 2. (3) 1 Doug McCollough, Webster City, Iowa. 3. (7) 7+ Jared Timmerman, Norwalk, Iowa. 4. (8) 14 Jake Sachau, Denison, Iowa. 5. (4) 56 Ty Griffith, Webster City, Iowa. 6. (5) 6 Chanse Hollatz, Clear Lake, Iowa. 7. (1) 52 Carter Koop, Rockwell, Iowa. 8. (9) 40 George Gilliland, Lehigh, Iowa. 9. (6) 26 Jason Carney, Boone, Iowa. 1. (5) 19 Carter Shumski, Fairmont, Minn.
2. (6) 85t Brandon Toftee, Webster City, Iowa. 3. (1) 51x Matt Webb, Des Moines, Iowa. 4. (3) 10r Brandon Ratcliff, Kamrar, Iowa. 5. (2) 88n Nate Albrant, Thompson, Iowa. 6. (9) 02 Andrew Schroeder, Keswick, Iowa. 7. (8) 88 Bryer McCoy, Webster City, Iowa. 8. (7) T16 Taylor Elliott, Webster City, Iowa. 9. (4) 38s Paul Atchison, Webster City, Iowa. 1. (7) 14 Jake Sachau, Denison, Iowa, $1000. 2. (2) 19 Carter Shumski, Fairmont, Minn., $300. 3. (5) 7+ Jared Timmerman, Norwalk, Iowa, $250. 4. (3) 1 Doug McCollough, Webster City, Iowa, $200. 5. (9) 56 Ty Griffith, Webster City, Iowa, $175. 6. (4) 85t Brandon Toftee, Webster City, Iowa, $150. 7. (12) 02 Andrew Schroeder, Keswick, Iowa, $130. 8. (6) 51x Matt Webb, Des Moines, Iowa, $120. 9. (10) 88n Nate Albrant, Thompson, Iowa, $110. 10. (11) 6 Chanse Hollatz, Clear Lake, Iowa, $100. 11. (13) 52 Carter Koop, Rockwell, Iowa, $95. 12. (8) 10r Brandon Ratcliff, Kamrar, Iowa, $90. 13. (15) 40 George Gilliland, Lehigh, Iowa, $85. 14. (18) 38s Paul Atchison, Webster City, Iowa, $80. 15. (1) 138 Jon Peed, Webster City, Iowa, $75. 16. (14) 88 Bryer McCoy, Webster City, Iowa, $40. 17. (16) T16 Taylor Elliott, Webster City, Iowa, $40. 18. (17) 26 Jason Carney, Boone, Iowa, $40. 1. (1) 32 Tony Smidt, Britt, Iowa. 2. (4) 21 Myles Michehl, Fort Dodge, Iowa. 3. (2) 6 Chanse Hollatz, Clear Lake, Iowa. 4. (6) 32j Austin Jahnz, Worthington, Minn.
5. (5) 50 Bryce Sommerfeld, Fort Dodge, Iowa. 6. (3) 48j Bryant Johnson, Worthington, Minn.
7. (7) 316 Seth Hellinga, Lake Park, Iowa. 1. (5) 88 Daniel Smith, Lake City, Iowa. 2. (3) 42t Tyson Overton, Carlisle, Iowa. 3. (4) 27k Keeran Sampson, Worthington, Minn.
4. (6) 4d Daniel Ayers, Webster City, Iowa. 5. (2) 85 Seth Jansen, Ogden, Iowa. 6. (1) 18 Ryan Boland, Fort Dodge, Iowa. 1. (5) 1 Derek Willert, Marble Rock, Iowa. 2. (3) 18z Zac Smith, Mason City, Iowa. 3. (1) 17j Jason Bradley, Sioux Falls, S.D. 4. (2) 76 Ben Peterson, Granada, Minn.
5. (7) 25t Tanner Redman, Blairsburg, Iowa. 6. (4) 7b Eric Stanton, Carlisle, Iowa. 7. (6) 18x Bryce Summers, Eagle Grove, Iowa. 1. (7) 6 Chanse Hollatz, Clear Lake, Iowa, $1000. 2. (18) 7b Eric Stanton, Carlisle, Iowa, $250. 3. (4) 21 Myles Michehl, Fort Dodge, Iowa, $200. 4. (3) 1 Derek Willert, Marble Rock, Iowa, $170. 5. (10) 32j Austin Jahnz, Worthington, Minn., $140. 6. (5) 42t Tyson Overton, Carlisle, Iowa, $120. 7. (8) 27k Keeran Sampson, Worthington, Minn., $110. 8. (1) 32 Tony Smidt, Britt, Iowa, $100. 10. (6) 18z Zac Smith, Mason City, Iowa, $90. 11. (13) 50 Bryce Sommerfeld, Fort Dodge, Iowa, $85. 12. (12) 76 Ben Peterson, Granada, Minn., $80. 13. (17) 18 Ryan Boland, Fort Dodge, Iowa, $75. 14. (9) 17j Jason Bradley, Sioux Falls, S.D., $70. 15. (19) 316 Seth Hellinga, Lake Park, Iowa, $65. 16. (15) 25t Tanner Redman, Blairsburg, Iowa, $60. 17. (2) 88 Daniel Smith, Lake City, Iowa, $60. 18. (14) 85 Seth Jansen, Ogden, Iowa, $40. 19. (16) 48j Bryant Johnson, Worthington, Minn., $40. 20. (20) 18x Bryce Summers, Eagle Grove, Iowa, $40. 1. (5) 9 Nate Coopman, Mankato, Minn.
2. (2) 37 Ryan Bryant, Mason City, Iowa. 3. (3) 5 Oliver Monson, Thornton, Iowa. 4. (6) 11a Bubba Brown, Jackson, Minn.
5. (1) 41 Matt Oberhelman, Fort Dodge, Iowa. 6. (8) N07 Brad Mayland, Britt, Iowa. 7. (4) 03 Matt Baker, Britt, Iowa. 8. (7) 45 John Dahlsten, Pomeroy, Iowa. 1. (1) 9 Nate Coopman, Mankato, Minn., $500. 2. (2) 37 Ryan Bryant, Mason City, Iowa, $100. 3. (4) 11a Bubba Brown, Jackson, Minn., $95. 4. (7) 03 Matt Baker, Britt, Iowa, $85. 5. (5) 41 Matt Oberhelman, Fort Dodge, Iowa, $75. 6. (8) 45 John Dahlsten, Pomeroy, Iowa, $65. 7. (6) N07 Brad Mayland, Britt, Iowa, $60. 8. (3) 5 Oliver Monson, Thornton, Iowa, $55. HAMILTON COUNTY SPEEDWAY MARKETING PARTNERS: American Family Insurance, Casey’s General Store, D&B Agro-Systems, DCD Concrete Coating, Diamond in the Rough, Dinsdale Auto, Doolittle Oil, Farm Credit Services of America, First State Bank, Flower Cart, Foam Catz, Foster Funeral Home, Gilbert Flooring & Paint, Gilbert Jewelers, Good Life RV, Hamilton County Speedway Racing Association (HCSRA), Humes Distributing, Hy-Vee, Integrity Trucking, Iowa’s Favorite Country K97, K.C. Nielson, KQWC Flight Q95, Lambert Lumber, Malvern Bank, Murphy Carpentry, NAPA Auto Parts, Olsen Family, Pepsi Beverages Co., Pizza Hut, Pruismann Painting, Ruba Lawn Care, Seneca Foundry, Spangler Automotive, Stein Heating & Cooling, Tolle Automotive , Tony’s Tire, Town & Country Insurance, The Trash Man, Van Diest Medical Center, Wide Open Race Engines and Windsor Manor Assisted Living.